Fire and bombs are being exchanged between Israel and the Gaza Strip. 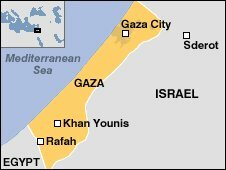 The Palestinian people live in the Gaza Strip, which is a small piece of land (about a quarter the size of London, UK) along the Mediterranean Sea between Israel and Egypt. The Gaza Strip is controlled by a Palestinian group called Hamas. The Palestinians want the Gaza Strip and another area where many Palestinians live called West Bank to be recognized as the country Palestine. However, most countries consider the Gaza Strip and West Bank to be occupied territories under Israel. One of Israel’s problems is that Hamas keeps firing rockets into Israel hurting its citizens and towns. One of Hamas’ problems is that Israel controls most of the Gaza Strip’s borders. The two have thrown bombs at each other in the past, but this is the worst fighting between the two in the last four years. Did you know? An Israeli company developed a pill called the PillCam. Like the name suggests, there is a camera inside the pill. The patient swallows the PillCam, and the doctor is able to investigate issues inside the patient’s body.